We are pleased to send you some information about the Global Article 9 Campaign to Abolish War's recent activities, notably on the Article 9 & Article 12 Conference - Peace Constitutions for Global Disarmament, and related developments. Held onboard Peace Boat's chartered ship the SS Oceanic on July 16, 2009 as it docked in Puntarenas, Costa Rica, the Article 9 & Article 12 Conference - Peace Constitutions for Global Disarmament was a success. More than 150 participants from Costa Rica, Ecuador, Panama, the United States, Switzerland and Japan explored the value of Article 9 of the Japanese Constitution and of Article 12 of the Costa Rican Constitution in their historical perspectives and contemporary contexts, as well as their regional and global significance. In a passionate message read on his behalf at the opening ceremony, Costa Rican President Oscar Arias welcomed the holding of the event in his country and spoke of Japan and Costa Rica's choice of "peace as a way of life" as "the start of a long and challenging journey." He encouraged participants to stay the course, as "the work of sustaining a lasting peace is endless." Other written and video messages of support to the conference were sent, including by US Congressman Dennis Kucinich, former Costa Rican President Luis Alberto Monge, Colin Archer of the International Peace Bureau, Ikeda Masanori of the Japanese Association of Lawyers Against Nuclear Arms (JALANA), and more, praising the role played by Costa Rica's and Japan's peace clauses in bringing about a culture of peace. Homero Arellano Lascano, Secretary General of the Vice Presidency of the Republic of Ecuador, expressed his support for peace constitutions, proclaiming that "both Article 9 and Article 12 are tied together in two constitutions of separate countries, but could become axes for pacifist mechanisms that today constitute the way of Peace" and pointed at Article 416 of the new Ecuadorean constitution. Indeed, following the Costa Rican precedent, his country and several others in Latin America have taken significant steps towards peace in recent months and adopted new constitutions in which they define themselves as pacifist countries that promote a culture of peace and universal disarmament. They also condemn the imposition of foreign military forces on their soils and the use of weapons of mass destruction. Katayama Yukio, a survivor of the atomic bomb from Hiroshima and Eto Michiko, a third generation survivor, both shared their personal stories and hope for a peaceful future that is free of nuclear weapons. The Global Article 9 Campaign has supported the work done by Peace Boat in sharing the testimonies of Hibakusha (atomic bomb survivors) as peace and disarmament educators raising awareness on the dangers of nuclear weapons and the human costs of war. In 2008, Peace Boat took a group of over 100 Hibakusha to more than 20 countries. This year, another group will join Peace Boat's 67th Global Voyage, during which they will visit Ecuador and there participate in a follow-up conference promoting peace constitutions around the world. Peace educator and consultant for peace and disarmament Alyn Ware from New Zealand highlighted the fact that many regions, including Latin America, Antarctica, New Zealand and Mongolia, are nuclear weapon free zones. Creating a nuclear weapons-free world is possible, he said, by pushing for the creation of other nuclear weapon free zones in the world and promoting the establishment of demilitarized zones. Costa Rican activist and lawyer Roberto Zamora compared the debates taking place around Article 9 in Japan and Article 12 in Costa Rica. He encouraged the Japanese in the audience to act to protect their peace clause, like he did when he challenged his government's position on the Iraq war in the constitutional court of Costa Rica. His action led to a landmark ruling that Costa Rica cannot support wars in any way, nor can it support the manufacturing of nuclear weapons. Participants at the conference examined the links between such national peace clauses and Article 26 of the United Nations Charter, which calls for the establishment of a system for the regulation of armaments with the least diversion of the world's human and economic resources for armaments in order to promote the establishment and maintenance of international peace and security. Building upon its history of using what would otherwise be the military budget for education after disbanding its army, Costa Rica initiated a debate in the UN Security Council on collective security and armaments regulation in November of 2008. Welcoming the initiative, the conference discussed its significance and explored ways to develop national, regional and global efforts towards shifting priorities by which resources are allocated. "Is it not obscene that the world is spending over $3.3 billion per day on weapons? ", asked Jonathan Granoff, President of the Global Security Institute, joining his voice in advocating for a decrease in military expenditures to invest instead in financing sustainable development and human security. The conference concluded by adopting the Puntarenas Declaration, proposing a UN resolution that acknowledges the role peace constitutions play in promoting global disarmament, and calling on governments to shift priorities in the allocation of resources. The declaration calls for a decrease in military expenditures in order to invest in financing sustainable development, human security and peace. It also encourages participation in the Global Forum on Peace Constitutions to be held in Ecuador in November 2009, during which concrete functions and responsibilities of peace constitutions will be discussed and further action encouraged. Read the final declaration of the conference here. View the program of the conference here, as well as the guest profiles here. Read Costa Rican President Oscar Arias' message to the conference here; Secretary General of the Vice Presidency of the Republic of Ecuador Homero Arellano Lascano's speech here; as well as the transcript of US Congressman Dennis Kucinich here. More speeches will be made available on the Global Article 9 Campaign's website shortly. This event was co-sponsored by Peace Boat, the Latin American Branch of the International Association of Lawyers Against Nuclear Arms (IALANA), the Global Article 9 Campaign, the Faculty of Law at the University of Costa Rica, and the Japanese Lawyers International Solidarity Association (JALISA). Pictures: (1) Homero Arellano Lascano, Secretary General of the Republic of Ecuador's Vice Presidential Office, speaks about the objectives of the new Ecuadorian constitution. (2) Carlos Vargas of IALANA (left) and Kawasaki Akira of Peace Boat/Global Article 9 Campaign to Abolish War (right) discuss the importance of international collaboration and peace constitutions worldwide. Following the arrests on June 30 of Nobel Peace Laureate Mairead Maguire, former US Congresswoman Cynthia McKinney and approximately 20 human rights activists participating on a mission of the Free Gaza Movement, the Global Article 9 Campaign and Peace Boat issued a joint appeal calling for their release. After being held for several days in detention, the mission members were released and deported to their respective countries of origin, with the last of the group eventually recovering their freedom on July 7. Since their liberation, the activists have described the aggressive tactics used by Israeli forces to intercept their boat, the deplorable prison conditions in which they were held, and how their equipment and supplies were confiscated and destroyed. The mission aimed to break the blockade on the Palestinian territory and to deliver medicine, toys, and home rebuilding materials to the people of Gaza. 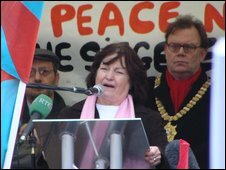 A strong advocate of the Global Article 9 Campaign to Abolish War, Mairead Maguire, who won the 1976 Nobel Peace Prize for her efforts to reconcile Catholics and Protestants in Belfast, has been involved in Palestinian advocacy for several years. View a video of the mission's interception by Israeli forces, here. Read the joint appeal by the Global Article 9 Campaign and Peace Boat calling for the immediate and unconditional release of Nobel Peace Laureate Mairead Maguire and other members of the mission, here. Supporters of the Global Article 9 Campaign also organized a demonstration in Tokyo to express their demands to the Israeli Embassy and the media, and raise awareness of the situation amongst the Japanese public. Read the poem Mairead Maguire wrote from here prison cell, here. Visit the Free Gaza Movement's website, here. View the reports by the Nobel Women's Initiative, here. The Japanese media have recently publicized reports about the existence of a secret agreement between the US and Japan in violation of Tokyo's longstanding policy of not possessing or producing nuclear weapons or allowing them on its territory. Japan's Three Non-Nuclear Principles - as they are known - were first announced by then Prime Minister Sato Eisaku in December 1967. Codified in 1971 by a resolution in the Diet that stipulated that Japan would abide by them, the Three Principles have since been regarded as Japan's national policy. Sato received the Nobel Peace Prize for them in 1974. During his Nobel Lecture, he explained that the choice to unequivocally renounce to nuclear weapons was based on the country's excruciating experience of the atomic bomb and Article 9 of its peace constitution. Today, former Japanese government officials finally admitted that a secret deal between the Japanese and US governments allowing port-calls and transits of any nuclear-weapon-equipped vessels existed prior to the formal announcement of the Three Non-Nuclear Principles. Indeed, since the 1960s, Japan and the United States concluded a series of confidential agreements that tacitly allowed US military aircrafts or vessels carrying atomic weapons to stop-over Japan's territory. Though declassified US documents have long indicated the existence of such secret deal, the Japanese government has consistently denied it publicly and claims to uphold the Three Non-Nuclear Principles. Only recently have former Japanese top officials, notably former Vice Foreign Minister Murata Ryohei who served in the late 1980s, started admitting the existence of such agreement and testified of the existence of the accord in various media interviews. "It was a great secret. The Japanese government has been lying to its people," Murata said, describing how upon becoming Vice Foreign Minister, he heard from his predecessor - and later turned it over to his successor - that an unpublicized understanding existed between Japan and the United States concerning nuclear weapons. Further revelations suggest that in the 1970s, Tokyo apparently aimed at formalizing the agreement and modifying the interpretation of the principle of no entry of nuclear weapons into Japan. But due to changes of appointment in the Cabinet, formalization never took place. Today's exposure of the secret deal between Tokyo and Washington occur in the context of US President Barack Obama's stated efforts towards global nuclear disarmament and at a time when Japanese and US foreign and defense officials have started holding regular talks on the role of US nuclear deterrence in protecting Japan. Many mainstream conservatives in Japan call for "strong, effective and credible" deterrence following North Korea's nuclear tests and insist for a more "visible" US nuclear umbrella. Admitting the existence of the secret agreement may be a way to implicitly or explicitly create a fait accompli paving the way to revisit Japan's Three Non-Nuclear Principles. The debate over Japan's Non-Nuclear Principles is closely related to the one on revising Article 9 of the Constitution, as the spirit of Article 9 rejects dependence on nuclear weapons in security policies and the basis for these principles goes back to Japan's peace constitution. For more information about this issue, read media reports in the Japan Times and the Straits Times, for example, as well as the Japanese Ministry of Foreign Affairs' official position. As the Japanese imperial couple was about to visit Canada, eight organizations in Canada issued an open letter asking Emperor and Empress for their support in keeping "Article 9 intact in the spirit of peace" and appealing for continued efforts in "helping bring healing and justice to the victims of atrocities committed by Japan before and during the Asia-Pacific War". Co-signed by Japanese, Chinese, Korean, Filipino and other Canadian associations, the letter pointed to the fact the Japanese Parliament had "yet to pass a resolution that fully admits and apologizes for Japan's responsibility for the loss and suffering of the victims of the Asia-Pacific War". The Canadian, Japanese and Korean media provided broad coverage of the initiative. Find media reports here. Read the Open Letter to the Emperor and Empress, here. For more information, please visit the Peace Philosophy Centre's blog here.